I’d always been a little nervous about making kimchi, Korea’s glorious version of sauerkraut. Kimchi, if you’ve never eaten it, is essentially the national dish of Korea, is eaten with everything and comes in myriad forms. Every Korean I’ve ever met is a self-described authority on kimchi, much the way Italians are with pasta or the way New Jerseyans and New Yorkers are with pizza and bagels. Helen explained that good kimchi is fermented for quite a long time, and it develops a particular aftertaste, as well as a slight fizziness from the ferment. This is what separates “real” kimchi from kimchi-flavored crap, she said. Buoyed by Helen’s vote of confidence, I made more kimchi. What is it, you ask? Well, it is a vegetable of some sort — usually cabbage, daikon or green onions — fermented with salt, soy or fish sauce, garlic, ginger and LOTS of chiles. It sits around for anything from a few days to a year, melding flavors and generally doing its microbial thing. When you eat it, it is a nuclear bomb of flavor. Pungent, picante and powerful all at once. A little goes a long way. Unless you are Korean, in which case you can eat tubs of the stuff. I like it next to bland foods like steamed rice, simply cooked meat and fish — especially bass and catfish — and in kimchi dumplings. It’s really good with bulgogi, that other national dish of Korea, too. 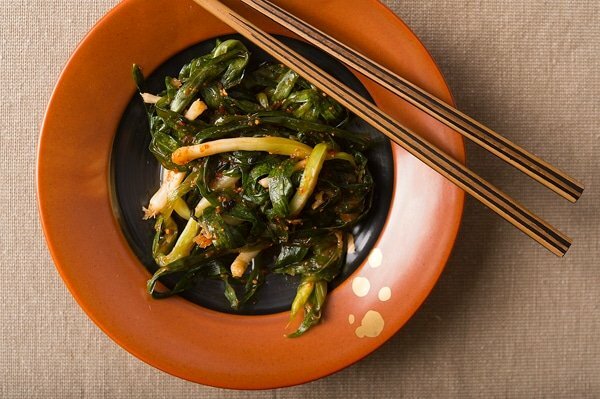 This recipe is for pa kimchi, or green onion kimchi. 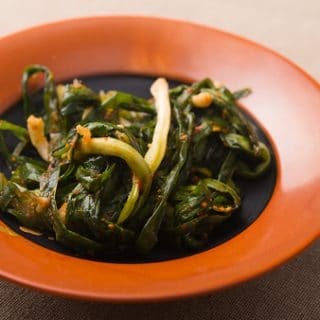 Koreans use scallions or other green onions, which you can of course use, but I prefer to use wild onions like ramps, the Sierra wild onions we get at high elevations, or three-cornered leeks, which are an invasive species around these parts. Everyone reading this has some sort of wild onion living near you, so give this recipe a go this spring. It will be ready right when you break out the grill. 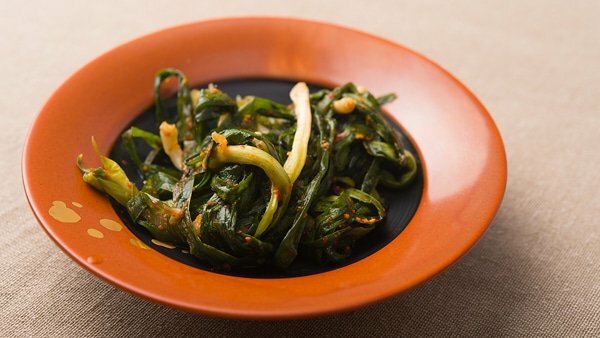 This is a traditional style of Korean kimchi, made with green onions. It really doesn't matter what kind you use: Scallions, green onions, ramps, or in my case, Allium triquetrum, the three-cornered leek. This is a fermented pickle, with no vinegar, so you need to follow the instructions closely when it comes to salt, or in this case fish sauce. You can use soy sauce in place of fish sauce, but it won't be the same. The salt level kills most spoilage bacteria while letting the good bacteria thrive. You literally want to see a little bit of fizzy action going on with this kimchi when it's ready. Make sure all the green onions are clean. If the tops have not been trimmed, cut off about 1 to 2 inches of the top green part, which is very stringy. Dissolve the kosher salt into 5 cups of water. Soak the green onions in the water for 1 hour. Meanwhile, bring the other cup of water to a boil and whisk in the rice flour. Turn off the heat and keep stirring until the flour is totally incorporated into the water. Let this cool while the onions soak. When the rice flour mixture is cool, mix in the remaining ingredients and put everything in a very large bowl or a rimmed baking sheet. Take each onion and, if you want, wrap the green end around the white part to make each onion more compact; most Korean recipes do this. Alternatively, you can chop them coarsely. Put on some latex or rubber gloves if you have them, because you're gonna get messy. Mix the onions with the spice mixture so they are completely coated, then cram them into quart Mason jars. Leave about 3 to 4 inches headspace. You can take your gloves off now. Find a smaller jar or some sort of clean weight -- I used narrow jelly jars -- and fill it with water. Use this smaller jar to weigh down the kimchi in the Mason jar so it is totally submerged. Let these jars sit in a cool, dark place (cool room temperature is perfect) for at least 3 days, and up to 2 weeks. To store, remove the smaller jars and redistribute the kimchi into wide-mouth pint jars. Cap and refrigerate for up to 6 months. Storing it in the fridge radically slows the fermentation, and once made this kimchi will keep for months. Just be sure to eat some every few weeks -- or at least open the lid. Pressure will slowly build up in the jar, and you will need to relieve that. Serve the kimchi alongside mild meats such as fish or chicken, or as a condiment with rice or other foods. It's also good minced and stuck inside a dumpling. 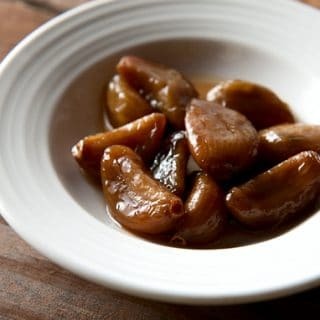 You can find all sorts of recipes for pickled and preserved foods here in Hunter Angler Gardener Cook! I have tried the recipe. I live in Malaysia and we have plenty of these wild onions here. Very flavourful and goes well with bland food like fish. Love it. Thanks for sharing the recipe. wonderful-thanks! We eat these 3-cornered onions all late winter because they grow copiously here in my pasture; they don’t really have a strong flavor though, so i try to use them as raw as possible. i think kim chi will be a good way to use them as their flavor will come out more. Hi Hank, I just wanted to thank you for this recipe. I’ve made a lot of kimchi over the years – I used to cook at a Korean restaurant – and this is now my go-to recipe. Enjoying the podcast too. Keep up the good work.